Charles Leclerc says it's too early to dream about a future at Ferrari. The reigning Formula 2 champion is backed by Ferrari, and has been placed at the newly Alfa Romeo-sponsored Sauber team for his F1 debut in 2018. But when asked if he is eyeing Kimi Raikkonen's Ferrari seat for 2019, he told RMC: "Honestly, no. "It's so big a dream that for now I can't imagine it as a reality. "So I'm going to focus on 2018, which is very important for me. It's my first season and I have to prove myself," Leclerc added. "I do have very close ties with Ferrari, I'm one of their drivers so they're watching me, but I am not thinking about 2019." However, the 20-year-old may actually be quite close to making his Ferrari debut, with Blick newspaper reporting that Leclerc is the Maranello team's 2018 reserve driver. 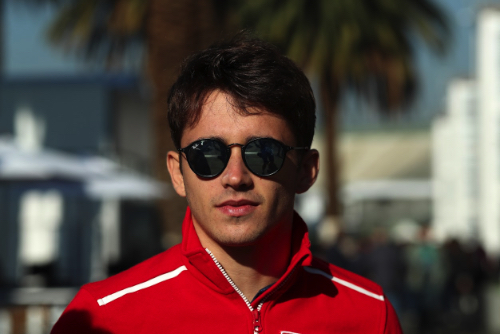 "I have no idea if I'll get the Ferrari seat in an emergency," Leclerc insisted. "If they asked me it would be a dream come true, but for now I'm driving for Alfa-Sauber."